You are here: Home / Portfolio / Bringing the Beach Indoors. Welcome to my new website and blog. I’m so excited to share my interior design projects, trends, ideas, advice and everything else that gets stored in my head along the way. Aside from interior design talk, I’ll be sharing my favorite summer recipes, dinner party ideas and just plain and simple, good living! After all you can’t serve up a great recipe at a dinner party without having the right table settings and dining pieces. I mean, really! Since it is officially summer time, like most Long Islanders and anyone wanting to spend every sunny day outdoors, my first thought is about hitting the beach. Salt air, the wide open Atlantic, and shell collecting. 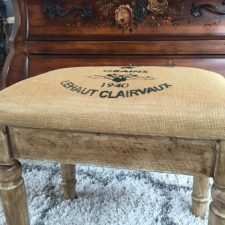 For me this also signifies what my client’s will be looking for when they want to freshen and update their year round or summer home. 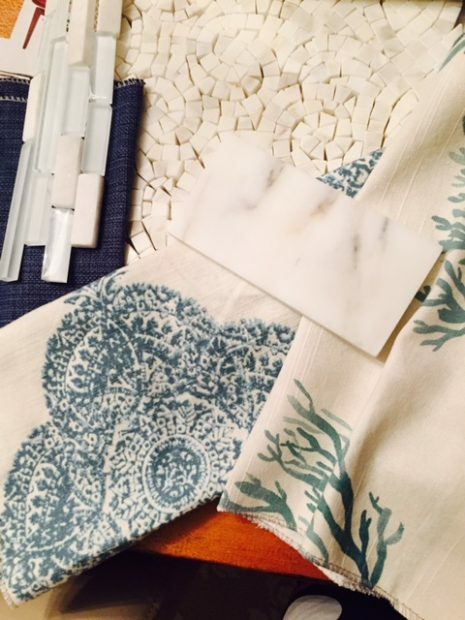 What my clients love to do (and so do I) when this time of year rolls in is to add hints of the glorious beach and outdoors to their interiors. Think driftwoods, hues of blue, coral and aqua, and lots of shell strewn fabrics and accessories. It sounds cliche but they do work together if done in small doses, and in the right places! And let’s not forget the fresh flowers. Bring in the hydrangeas, lavenders, the short lived peonies and anything that adds color! 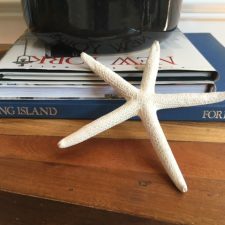 Take a peek at some of the beach inspired decor below and see what I mean. 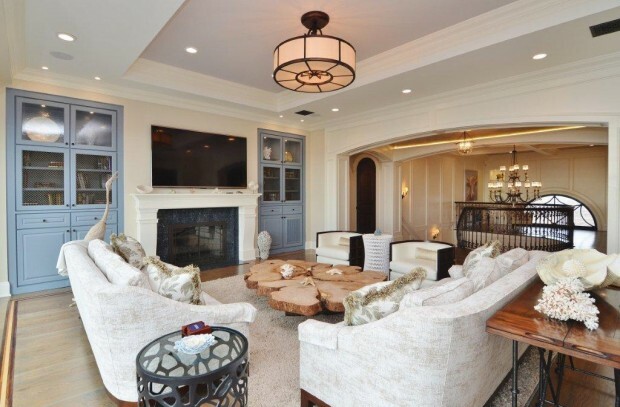 This carved wood coffee table fits right in with the gorgeous, blue built in and shell accessories. 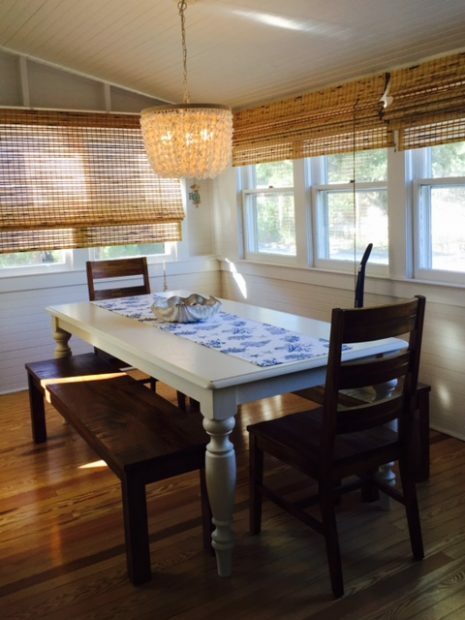 A shell strung chandelier, one of my favorites, makes a big impact in this small beach cottage dining area. 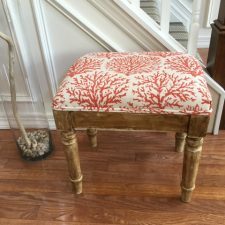 This bench recently got a summery, coral makeover that we love. Fabric and tile that feels fresh no matter what time of year. Lastly but never least, bring in the accessories and blooms! Everyone loves a good shell accent. I have yet to be in a summer home without one. 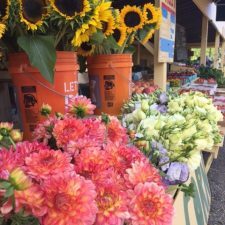 And, if your’e not getting your blooms at the market and are cutting yourself, do it early in the morning or late day when the sun is no longer at it’s hottest and place immediately in water. For closed blooms, place in warm water to force them open for an instant flower accent! Well, time for me to get back to my other job, which is finding this beautiful decor for your homes. Thanks for signing up and please feel free to invite your friends! I am open to topic requests too. Keep in mind that I may take my time in between posts since it is also my design studio’s busy season (after all, it is summer)! Previous Post: « Don’t recognize us? Well, we have made some changes in our own home!